Preheat oven to 375 degrees. Lightly oil an 8 or 9-inch by 5-inch baking dish. Set aside. Heat oil over medium-high heat. Add the onion, reduce heat to medium-low and cook 2-3 minutes. Add the chopped bell pepper and continue cooking 8-10 minutes or until bell pepper begins to soften. Add the zucchini and cook 2-3 minutes more or until zucchini begins to soften. Stir in garlic, 2 tablespoons chopped parsley, oregano, dill and crushed red pepper if using. Set aside to cool slightly. In a large bowl, combine vegetables, brown rice, ricotta and feta cheeses, lemon juice and salt and black pepper to taste. Transfer to the prepared baking dish and smooth the top. 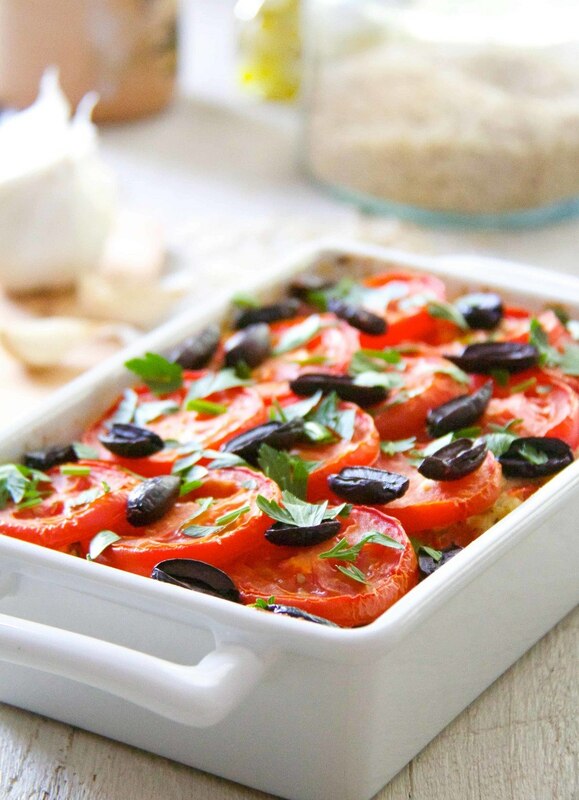 Place tomato slices over the top then sprinkle with halved Kalamata olives. Bake for 30 to 45 minutes or until hot throughout. Remove from oven and sprinkle with remaining chopped parsley.